A conservation easement can significantly complicate the land you hold. If you are the landowner, a conservation easement restricts what you can do with that land. While the purposes of this type of agreement are typically conservation objectives, the reality is that a conservation easement is perpetual. It impacts not only how you use the land but what future owners can do with it. Once a conservation easement is in place, it’s usually there to stay. These restrictions often influence the value of your property. That means that high-quality conservation easement appraisals are important in a variety of situations but most especially if you are looking to buy or donate your land. The conservation easement might complicate what would otherwise be a straightforward purchase or donation. Your privately-owned property may contain a wildlife habitat. If that’s the case, many development ideas will not be allowed there for the protection of that habitat. Alternatively, it may be that your land is essential to permit timber harvesting or farming, to the exclusion of other uses. The conservation easement may affect only a portion of the land or the entire area. It may be minimally or exceedingly restrictive. Whatever the conservation restriction for your real property, there may come a time when you consider your options of what to do with it next. If you choose to donate property that has a conservation easement to a land protection organization, the good news is that you may be able to claim a tax deduction on your federal taxes that is equal to the value of the land. Only a qualified appraiser can provide the ‘before and after’ evaluation you need for the IRS. It’s important to review all questions concerning this donation and deduction with a seasoned tax attorney. ● The document is well-written, easy to understand, concise and contains supporting documentation. ● The value given to a property takes into account comparable sales within the geographic area of the subject property. ● If highest and best use analysis is present, the appraisal must also have a market analysis. ● It must comply with the Internal Revenue Code and requirements of the Treasury Regulation. ● Complete information, including failed attempts to sell the property, should also be part of the appraisal. ● Make sure your appraisal is current – 60 days or less. 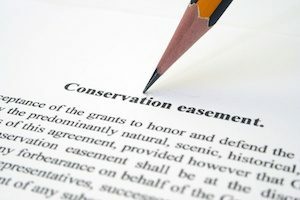 It’s important to look at the conservation easement when valuing a property that will go on the market. If you are planning to sell or buy such property, a conservation easement appraisal is a requirement. The reality is that the property will have a lower value than a similar property that does not have a conservation easement. The most common approach to this type of appraisal is the ‘before and after’ approach. Essentially, this includes two appraisals. One is the unrestricted “before” highest and best use value of the property. The other is the new highest and best use appraisal that takes into consideration the restrictions placed on the property, and its limited potential. ● The effects on the highest and best use of the real property. Typically a valuation company will take the sales comparison approach to set before and after values for your property. A conservation easement is in place for the betterment of the earth. While it may prevent you from using your land in the way you wanted, you should rest assured that your property is helping the environment, and will do so for many years to come. Choose a trusted, professional valuation company to provide you with a new and up-to-date value of your land with a conservation easement appraisal you can depend on to be accurate. Have more questions about conservation easement appraisals? Not sure what this really means for you and your property? Contact our experts at Global Valuation today.